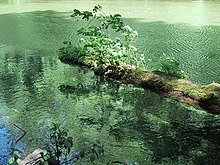 Terrestrial and aquatic phototrophs: Plants grow on a fallen log floating in algae rich water. Phototrophs (photo = light, troph = nutrition) or photoautotrophs are organisms which carry out photosynthesis. With their plastids and the help of energy from sunlight, carbon dioxide and water are converted into sugar by photosynthesis. Sugar is then converted into other organic molecules which can be used in cellular functions. Such a function might be, for example, respiration. This page was last changed on 23 March 2014, at 19:56.